It was with this in mind that I chose to develop a mixed age space for children from 2 to 5 years of age. Traditionally private settings consist of two rooms; one room space for children age 2-3 years old, and another for children age 3-5 years of age. children who did not have siblings, would benefit from mixed age group as it would allow younger children to interact with older children and older children to do the same with the younger group. Children mirror and imitate each other as they play. In the nursery I managed Combining the two rooms was important for outdoor play for the 2-3year old room as initially they had no direct access to the outdoor space and were scheduled for outdoor play. This meant that younger children had limited time spent in the garden and when they returned indoors it was often under the direction of the adult and not their free choice. This again would cause distress to our 2-3 year olds as they were often engrossed in play that was very imaginative or creative. In order to make this a sustainable space I first had to research the combining of 2-3 year old and 3-5 year old room. This included research through evidence based reading, visiting settings who were using this model and consultation with the children staff and parents. Consultation with staff involved good practice visits to inspirational nurseries who were successfully running mixed age rooms, showing the team the possibilities of what we could bring to the lives and education of children was endless.. Staff were initially hesitant about the changes focusing on the negatives challenges that may arise, such as the younger children disrupting the older children’s play, loose parts that are too small or delicate for the younger children to use and younger children mimicking some of the less positive behaviors of the older children. The children were instantly positive. Children who had siblings within the other room were excited to be able to play with their younger siblings and show them their toys and skills. Children without siblings talked about showing the younger children how to climb and use the balance bikes. The younger less verbal children, showed their enthusiasm by heading to the resources that were considered by staff as too challenging for their use and focusing for extended periods of time on how they can use and play with them. To build the confidence of staff we had several “trial” afternoons where the doors would be opened and all children could go where they wanted to, including the outdoor environment. Staff soon realized that although they had to be vigilant around some of the resources, the younger children were very engaged and many of the older children took on a leadership roles telling children that they “must be careful with that (scissors) as they were very sharp”. Now I had the support of both children and staff I had to concentrate on the parent’s acceptance and understanding of the changes. I opened the nursery up to parents, put on a presentation and shared my thoughts regarding the changes. I discussed several aspects that impact children’s well-being such as their transitions between the two rooms and the loss that can be felt by a younger child when they move away from their nursery care giver. I then went onto explain that children would now remain with that significant other, their key worker, throughout their nursery journey from the age of two until leaving for school. Children with siblings would be able to spend time together however due to the layout of the room children could also spend time apart if they wished. Children from our younger age group would now have free flow access to the outdoor space. Most parents were supportive and enthusiastic about the changes and others who voiced many of the same reservations as Practitioners had. As I was joining two separate spaces together the layout of the environment had to change significantly. Practitioners and team leaders worked together to design the new single environment. As a united team we have been able to use the space more effectively, creating quiet cosy areas, an exciting space for sensory exploration, and a role play space that truly allows the development of children’s imaginations in a stimulating and thoughtful way. We developed an art area where children have free access to resources that stimulate inquiry and creativity and a discovery area where children can explore a variety of loose parts, forces and science. Along with these, all children now have access to an inspiring outdoor area where their imaginations can develop through the large loose parts and construction equipment, along with a muddy area and a large outdoor sand pit a planting area and an outside water zone with running water with natural and imaginative resources. I have seen children’s confidence grow in the setting. Younger children will initiate role-play or garden activities that older children have long since mastered. However, the older children will happily re-experience their enjoyment of these younger games before leading it in a more complicated direction giving the younger children roles to play and directing the play. In this example both older and younger children developed skills and strategies that allowed them to remain playing. 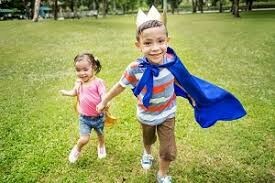 The morning drop off has become easier for siblings with less distress as the parent leaves, parents have commented that they feel their sibling children are much happier being in the same room and their older child will discuss the day of both children when questioned. One parent spoke saying that she would previously ask her child what he had done at nursery and the conversation would be “I played in the garden”. 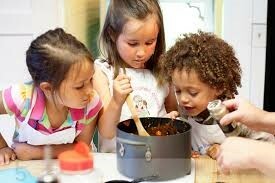 Since the room change, the older child will tell her lengthily about what the younger child has done, who the younger child has played with and what the younger child ate. Some of the information is factual and some is fictional but mum is not concerned with the content she just take pleasure in her child’s conversation and the animated nature of it. As a staff team we will to continue to evaluate the environment to ensure we are challenging children of all ages. Staff have become confident observers allowing children to be engrossed in their play without interruption. When they are invited into the play they are happy to join in. staffs observations and children’s conversations lead the planning ensuring children’s growing minds are challenged. Being in a mixed-age setting provides opportunities for younger children to observe, imitate, interact with older, more experienced children in the environment. Additionally, the younger children, do not seem ‘at risk’ of being hurt or mimicking negative behaviors as was thought by some staff and parents in the initial consultations. They were kept safe and able to participate when they chose to and did not appear to be overwhelmed by the older children which Katz (1995) has noted to be an unfounded concern that parents often have. We strongly believe that the children in our care have benefited socially and emotionally and educationally from this move and will continue to develop into confident young people whose needs are me by a dedicated staff team.